Send free postcards to your friends & relatives. Click the postcard above. Welcome to the Skylark Beach Oceanfront Inn, an Old Orchard Beach Maine Ocean Front Motel With Kitchenettes. We also feature suites and a large ocean view penthouse apartment. Walk directly onto the sand and into the cool ocean, for a great day of relaxation and fun. We boast the only 100 foot oceanfront grass patio on the entire 7 mile beach, including tables, chairs, umbrellas & 3 barbeque grills! We are located on Brown Street, a quiet side street off of East Grand Avenue. Located just three blocks from Town Center, you can enjoy a leisurely stroll to the Pier, Palace Playland, and all of Old Orchard Beach's many amenities. For your additional convenience we also offer free Wi-Fi. Rich in history and rooted in tradition, Old Orchard Beach has been a favorite travel destination for more than two centuries. Some of the same attractions that brought visitors to Old Orchard long ago continue to attract eager new travelers to our vibrant beach community today. In addition to our beloved seven mile stretch of glistening beach, visitors are still delighted and thrilled by Old Orchard's oceanfront amusement park which was established in the early 1900's, and remains the only one of its kind in all of New England. Tourists also enjoy spending time at the Pier, dining at restaurants boasting "the best" lobster dinners in Maine, the easy access to intown shopping, refreshment stands and candy shops, weekly firework displays, concerts in Memorial Park and at the Pavilion, or a scenic ride on the Downeaster or local trolley. 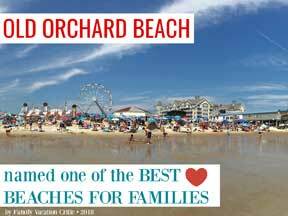 OLD ORCHARD BEACH was just named one of the Best Beaches For Families by Family Vacation Critic! For many who make the trip here, it is all about the "beach"—all seven miles of it. Some consider Old Orchard Beach to be the ideal summertime destination to relax and unwind. Many appreciate the white sand and the tumbling ocean surf, brightly colored umbrellas, sandcastles that line the shore, or simply the opportunity to capture our stunning beach at sunrise and sunset. If you are a visitor who has made an Old Orchard Beach vacation part of your family tradition, we are pleased to welcome you back and hope that you enjoy your stay! If you are considering exploring our area for the first time, you will soon find out why we are known as "Maine's Premier Beach Resort."